Designed for industrial duty performance. Compact in size, the JLC features a multiple disc motor brake, overload clutch, and chain end stop for safety. Rated loads from 1/8 - 2 Tons, with 10, 15, and 20 ft standard lifts (other lifts available by special order). Standard push button drop is 4 ft less than lift. CSA approved. Choose from 115/230V-1PH or 230/460V-3PH. Standard features include a rigid top hook, chain container (most models), an easy access panel plate for hoist maintenance, a multiple disc motor brake for positive load control, a 5-pocket sheave which increases chain-to-sheave engagement 25% over standard 4-pocket designs, mechanical overload protection and a finned aluminum housing with Class F insulation for longer life. Adjustable to regulate upper and lower load travel. Brass nuts standard for improved repeatability and chain positioning. Ergonomic design fits operator’s hand for thumb or two-handed operation. 24V control for operator safety. 115V control available upon request. 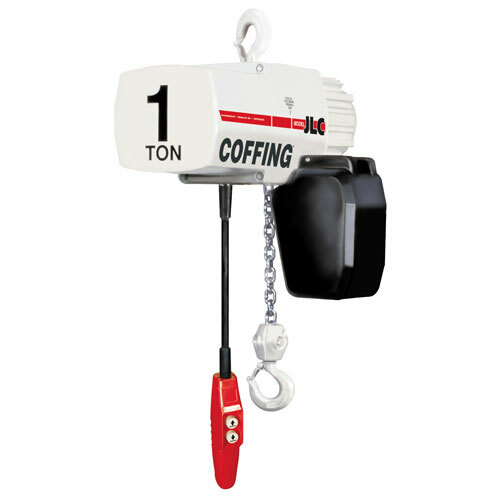 Standard on lifts up to 20 ft.
* Due to an increase in damaged freight and claims, Coffing electric chain hoists now ship only by freight truck.